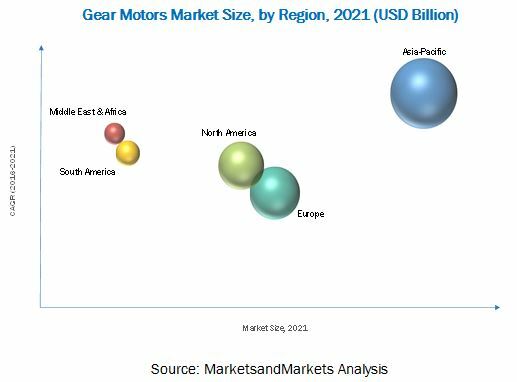 The global gear motors market is projected to grow at a CAGR of 5.8% from 2016 to 2021, to reach USD 23.94 Billion by 2021. This growth can be attributed to increasing wind power installations and growing concerns regarding the efficiency and cost-effectiveness of mechanical power transmission technologies. 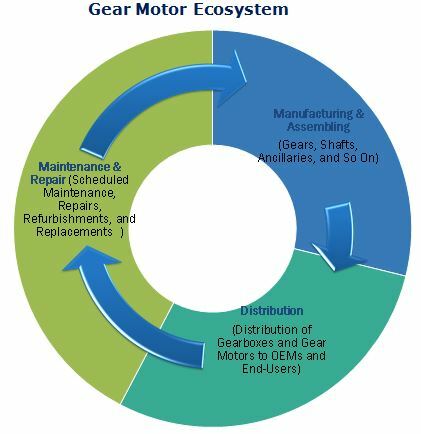 The report segments the gear motors market on the basis of major end-user industries into wind power, material handling, food & beverage, metals & mining, cement & aggregates, automotive, power generation (excluding wind power), construction, chemicals, rubber, & plastics, marine, and other industries. The wind power and material handling industries are projected to be the fastest-growing segments in the gear motors market during the forecast period. In terms of gear type, planetary gears are estimated to constitute the fastest-growing segment in the market. The demand for helical gear motors is higher than that of other gear types. Helical gear motors held the largest share in the total gear motors market in 2015. These motors are expected to dominate the market during the forecast period. Asia-Pacific led the market for gear motors in 2015, owing to large-scale industrialization and infrastructural development in the region. Governments in Asia-Pacific are currently focusing on developing existing infrastructure. India and China are expected to be the fastest-growing markets in the region from 2016 to 2021. The figure below shows the market sizes of Asia-Pacific countries in 2016 and 2021, with CAGR from 2016 to 2021. Manufacturing a gear motor requires a gear assembly, shaft, motor (integrated unit in case of a gear motor), an enclosure of desired specification, wirings, and so on. The prices of the major components required for gear motors are relatively less volatile, which makes the overall assembly of the device inexpensive compared to competing products such as direct drives. This makes the gear motor a highly attractive product. However, the price difference has little consequence when the process is very critical and requires superior efficiency and control. This factor has proved to be a restraint for the gear motors market. Siemens AG (Germany), a frontrunner in the market, tries to set benchmarks by improving innovation and providing leading technologies related to power products. The company has designed a comprehensive strategic framework called Vision 2020, with the aim of driving performance in the short term, strengthening core in the medium term, and scaling up in the long term. The company is consolidating particular segments, such as the solution-driven segment, and is focusing on attaining in-depth expertise in niche markets and convergence in product-driven markets. Leading players are trying to penetrate developing economies, and are adopting various methods to increase their market share. Contracts & agreements was the strategy most commonly adopted by top players in the market, constituting 40% of the total development share from 2012 to 2015. It was followed by new product development, expansion, and other developments. 14.8 Brevini Power Transmission S.P.A.
14.9 China High Speed Transmission Equipment Group Co. Ltd.
14.10 Elecon Engineering Company Ltd.
14.13 Sumitomo Heavy Industries Ltd.